A few weeks ago I shared a LSA study commissioned by Mono on our company’s slack #learning channel: Meet the New SMB SaaS Customer. At MarketGoo we’re always sharing content and discussing the unique features and behavior of SMB customers, but this research really struck a chord because the takeaways are very aligned to our next moves in this space. Before I share my thoughts I’ll be using a few acronyms, so I’d best lay them out beforehand. What are DIY, DIWM, DIFM services for SMB SaaS? DIY – Do-it-Yourself services. Our MarketGoo SEO tool is an example of a totally self-service tool. DIFM – Do-it-For-Me services. In the SEO space, managed SEO packages from Agencies and other SMB providers are an example of this approach. DIWM – Do-it-With-Me services. A hybrid of the previous two, where the client is still involved while outsourcing most of the work. An example is Vendasta’s white label agency where they take care of Agencies’ clients but still allow the Agency access to all processes, results and the possibility to do be involved in the work. This can even involve some crowdsourced work. The research shows that there are different demographics that respond better to certain service models, for instance ‘millenials’ are big into DIY. The Mono study states that larger SMBs as well as certain verticals (e.g. Health) prefer DIFM/DIWM – so there’s certainly ample space for both services to grow. 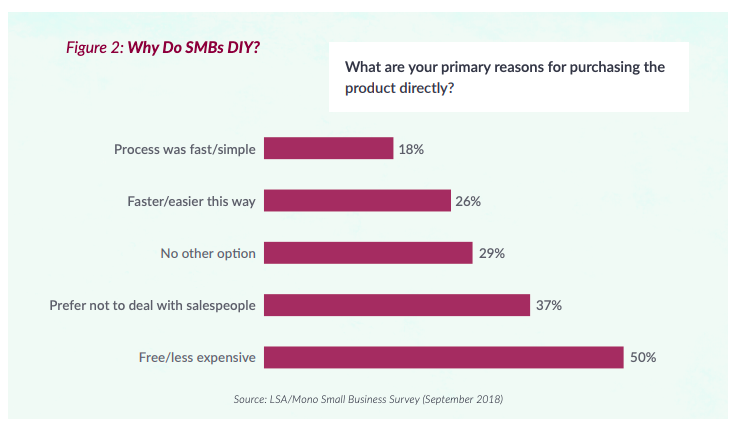 Importantly, we can see that those who prefer DIY are sick and tired of salespeople and demos being shoved down their throat. This may also be a segment that would be delighted with the DN approach. They want speed and a UX that’s fast and efficient. In the SMB SaaS space many of us have the urge to push demos, chat interactions and calls because it seems that SMBs respond well to that kind of high touch sales effort, but as we can see here, that’s certainly not always the case. With an upcoming change to our own free offering, we’re aiming to provide that very user experience – low touch, no cost, but high quality. There is a significant difference in the price ranges we see in DIY compared to DIFM. This especially makes sense for areas such as website building, e-mail marketing and SEO where DIY can mean doing the bare minimum work and DIFM can include a whole lot more (e.g. link building campaigns, creating content and optimizing listings) that leads to a much higher price. From the Ahrefs study on the cost of SEO, freelancers charge an average of $68/hour and SEO agencies charge almost double ($134.66), and for monthly retainers there is practically nothing below $500. These prices, compared to DIY which ranges from free to less than $50 per month, reveal a large gap. I believe this points to an opportunity, where the challenge is to deliver clear value in these higher tiers, and push them at the correct point in the user life-cycle. 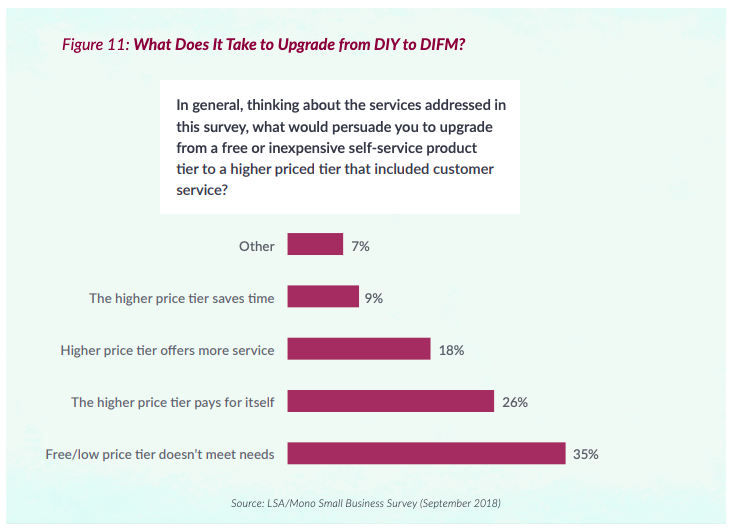 As the Mono study notes, 35% of respondents would upgrade to DIWM/DIFM once the lower or free tier no longer meets their needs. Particularly in our space, after covering the basics, SEO soon becomes about E-A-T which requires a time commitment from the DIY-er as well as a desire to learn the ropes. Add to that, there is no quick time-to-value because most SEO efforts (especially DIY ones) have a compounding effect that usually becomes visible beyond the 6 month mark, which often frustrates and disheartens users. This makes it a segment that is ripe for affordable DIWM and DIFM SEO services. These higher tiers may not appeal to an SMB upfront, but the need for them will become clear once they have engaged with the product and realized that they need help for their next steps. MarketGoo’s products are in the DIY space but we are seriously exploring DIWM as a natural progression where the DIY user recognizes the need for a more advanced service in order to meet their objectives, and can acquire it from within the application. SMBs are a complicated bunch. It’s a huge, fragmented market, and although it’s tempting to see it as a single segment, it’s actually made up of a collection of verticals where each SMB has its own needs, struggles, resource limits and priorities. What remains true for SMBs as a whole is that any solution that requires extremely high engagement from them will struggle. Even if it does truly solve pain points, this may likely never become apparent to the user because they can’t put the time in to engaging with it that much. Low cost, high quality products with low touch sales, as well as automation and DIWM/DIFM is what will be a driving factor in becoming a must-have in SMBs tech and marketing stack. We’re here to serve a need that exists, but to successfully enable users to succeed with our software, the group that needs to be flexible is us, the vendors. Continuously adapting our approach, understanding the DNA of SMBs and having a laser focus on product improvement is the secret sauce. I’d love to hear your thoughts on this market and its service needs.